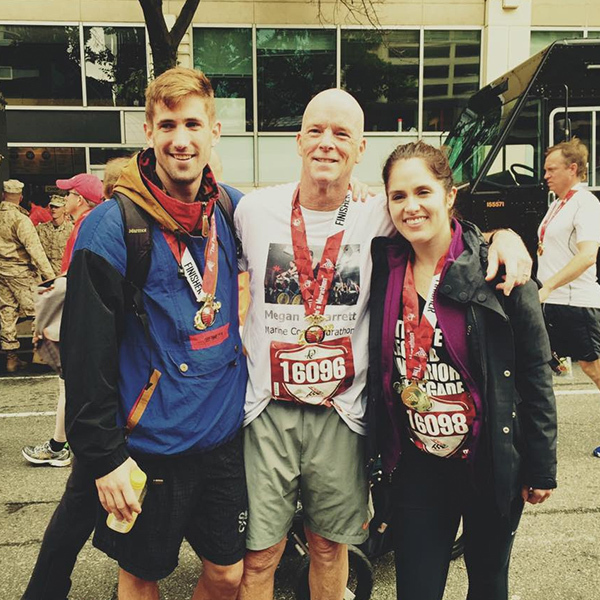 What inspired you to run the Marine Corps Marathon? Garrett and I were blessed to connect with an amazing individual in our classes this past year named Steve Whisnant. We built a special bond with Steve, who was battling a return of his cancer for much of last year. His cancer went into remission in March and the marathon (which he signed us up for) was a celebration of life for us. Had you always wanted to run a marathon? A marathon has also always been a personal goal of mine so for my "Resolution Ride" on January 1, 2015 I made every rider tell someone in the room their goal for 2015: I told everyone I was going to run a marathon. Check! Thank you, Steve! How did you stay motivated during your training? Steve rode approximately 10 to 12 classes with us while simultaneously battling cancer and the rigorous treatment along with it, never missing a day of work. He would sometimes even come from treatment to class or the following day — all without complaints. He was the hardest working person in the room. After seeing him go through that, I didn't have a lot to complain about. Also, the amount of support from other friends, family and riders who have run marathons and kept asking me "how's your training going?" was a big part of the motivation. What kept you going when training or hills got tough — or you hit a wall? Music definitely helped when training but interestingly enough I didn't use any for the race — Garrett kept me company with all his good jokes. 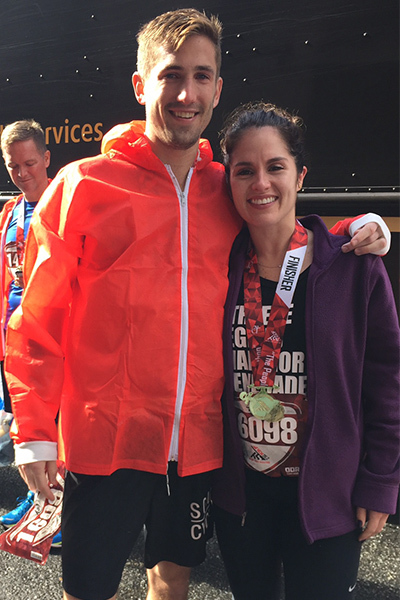 We ran together for most of the race, which was BIG help... always better when you have someone with you. In fact, to help keep my training on point, I started a running group on Tuesday nights with a group of friends — shout out to my brother Colin, Lola and Christina! It made training a lot more fun! What was the best part about the race? Is the finish line too cliche? Seeing friends and family cheering — my parents came to watch! — was such an awesome feeling. Hugging them at the finish line was pretty emotional. Do you have any advice for someone thinking about training for a marathon? Just do it. There is no right time… There were people running from ages 14 to 80 and every type of person in between. Being a part of this race made me realize that there is very little we are physically incapable of doing. And cross train, cross train, cross train: SoulCycle helped helped us so much more than we realized it would. What about race-day advice for people doing a marathon this fall? Wear layers. I wore a long sleeve shirt for the first half to stay warm because it was raining — and then tossed it. The marathon is great because they collect and donate any layers you tear off throughout the race. Oh, and hydration is KEY! Start at least 48 hours before. Listen to your body. My friend Dani joined me for a few miles at the end, which was INCREDIBLE. 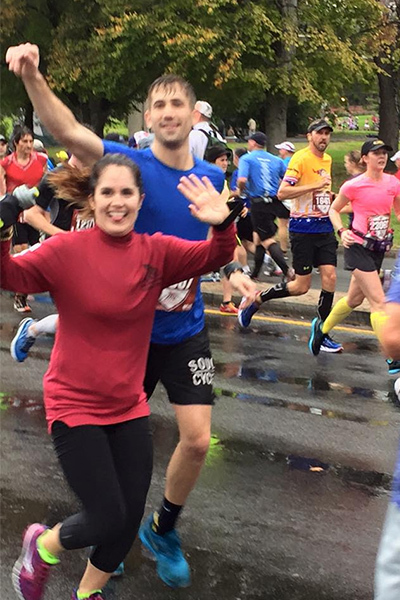 At mile 24, she told me to 'look up' and I saw a young man — a double leg amputee running with blades. Any pain I was feeling just immediately left and she said "let's go.” Dani, you rock and that man is my hero… but so are Steve and Garrett. Catch classes with MEGAN KELLY and GARRETT SCHLOSSER at SoulCycle Bethesda and SoulCycle DC. Want to ride at SOUL? Grab a series HERE and book a bike! Questions or comments? Email blog@soul-cycle.com!